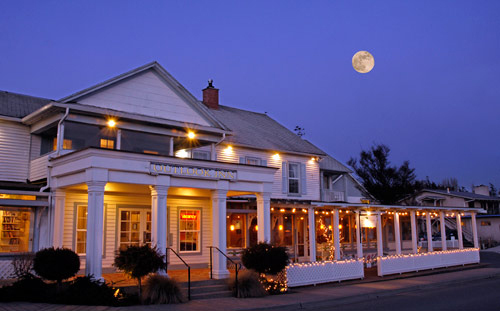 The Inn began life in 1876 under the auspices of settler Charles W. Shattuck. Sometimes known as the founder of Eastsound, he was a former forty-niner who came north from the California gold fields to prospect during the Fraser River gold rush. When his luck played out, he worked in a coal mine near the town of Seahome (Bellingham) from which he hurriedly departed after a fire and cave-in in the shaft. Shattuck headed to Orcas around 1860, pitched hi s tent near the current site of the Inn—probably due to the excellent spring that emerged here—and set himself up as a hunter. Like other early settlers, including Louis Cayou, he sold meat and hides to British buyers in Victoria. During Shattuck’s time, the elk herds that once roamed Orcas were hunted to extinction. In the late 1860’s as the island’s population steadily grew, Shattuck built a house at the head of Fishing Bay. After San Juan County was formed in 1873, he opened a small store in the house serving local farmers, lime kiln workers, passing Native Americans and occasional trappers. Four years later, he was named Postmaster of East Sound (the Postal Service renamed the office to Eastsound in 1985) and handled the mail next door to the store. To round out his activities, he built a dance hall upstairs with his own living quarters in the rear. Shattuck’s place was an all-in-one establishment. In addition to buying supplies, posting a letter or dancing, customers could get a haircut, a tooth pulled or their horses shod. If they got a little too rambunctious, they were likely to end up in the jail just outside the back door. In 1887, Shattuck sold the operation to Walter Sutherland, a former railroad man who originally came from New York. With his son, Luther, Sutherland set about remodeling and expanding the building. 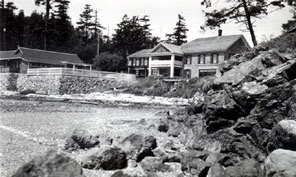 In 1891, they opened a 22-room hotel named Eastsound House. The hostelry was famous for its thick steaks of venison and bear meat. As Eastsound became a settled village with grocery, drug stores, hardware stores, churches and a school, the Inn served as the favorite place for locals. Eastsound House also became the focal point of a new industry on Orcas—tourism. 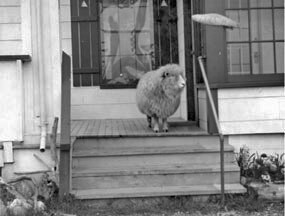 Sojourners from Seattle increasingly sought the island’s rural tranquility arriving by boat to attend dances and clam bakes or simply to relax in a rocker on the verandah. Access was at first via Anacortes on paddle wheelers such as the State of Washington and thence to Eastsound by small steamer. Direct service soon became available from Whatcom and Seattle aboard such famous steamers as the Islander, Rosalie and Lydia Thompson. In 1908, Eastsound House was sold to Mrs. Ida Baker. After which, it went through a series of changes. Variously operated as the Mt. Constitution Inn and the Beach Hotel, the establishment was simply called Baker’s Beach by most locals to avoid confusion. Baker actively promoted her business offering tennis and croquet as well as dances, hay rides and clam bakes. At one point, she even claimed curative powers for the waters of the spring. Nonetheless, business steadily declined and she closed the doors in the late 20’s. The building sat empty for some 15 years as the island economy declined due to the Great Depression and downturns in farming, fishing and forestry. In 1942, Seattle capitalist, Fred P. Myers, purchased it. He refurbished it completely then quickly sold it to his old friend, E.G. McMicken, a former steamship man. It was McMicken and his wife who named it the Outlook Inn. Under their management, the old hotel gained a new reputation for fine dining combined with country tranquility. McMicken sold it in 1946 due to poor health. After which, the Inn was sold three more times. When the Inn was purchased by a non-profit organization in 1967, it was in a state of disrepair and lacking in amenities. It had an uneven log foundation, no insulation, two toilets for 12 rooms, an oil-fired range in the kitchen, dangerous wiring, one telephone and no heat in the bedrooms. Laundry was done by hand and put outside to dry. The organization sought to restore the Inn to a more original state and, after many repairs and much remodeling, the Inn provided lodging and an outstanding restaurant known by residents and travelers for homemade bread, clam chowder and apple pie. Staff came from all over the country to help with the restoration and to partake in the organization’s activities. They lived on the property, tended the gardens, cooked and served the meals and cleaned the rooms while learning to “find yourself by losing yourself”. The profits were allocated for monthly conferences with famous personages of the time (best selling authors, college presidents, leading doctors of various occupations, and others). Additionally, the Inn sponsored teenagers in drug rehabilitation, offered classes and teachings and pioneered a unique curriculum for bright under-achievers that served as a pilot model for special educational institutions. The goal of the Inn and the staff was to be of service to mankind in any manner possible and to create a nurturing environment that allowed for guests to truly take pleasure in the island and themselves. A second building was erected in the 1980’s housing traditional type rooms with private bathrooms. The Bay View Luxury Suites building was built in 1995. A “family-style” corporation now owns the Inn - the natural evolution as it became more of a commercial establishment. Yet, the staff maintains the principals of service to guests, community and employees. It is still the perfect place to “lose yourself”. Older PostWhere is Orcas Island?